Kent locations used: Bluewater Quarry, Chislehurst Caves, Stone House Farm Caves. 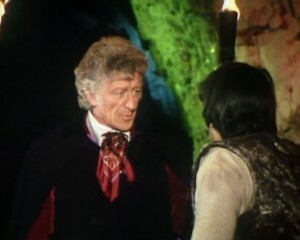 The Mutants is a six part story of popular sci-fi show, Doctor Who, starring Jon Pertwee. The Doctor and his companion, Jo, arrive at Skybase One during the 30th century when the planet, Solos is fighting for independence from the Earth’s empire. 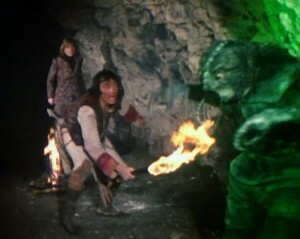 However, the natives have started to mutate in to hideous looking creatures and the doctor needs to find out why. Jon Pertwee (Worzel Gummidge, Jackanory) stars as the third Doctor alongside Katy Manning (Gloria’s House, Evil Never Dies), Paul Whitsun-Jones (The Quatermass Experiment, Huntingtower), James Mellor (Marat/Sade, The Oblong Box) and Garrick Hagon (Star Wars: Episode IV – A New Hope, Charlie and the Chocolate Factory). The production visited Bluewater Quarry which was the setting for the planet Solos prior to the shopping centre being built. The quarry began in the early 19th century and was then rapidly enlarged for cement production in the 1950’s; however it then closed down in the 1980’s and is now Bluewater shopping centre. Chislehurst Caves also feature and doubled as the interior Solos’ caves. Chislehurst Caves are man-made and 22 miles long, initially dug as chalk and flint mines and are believed to have been last worked in during the 1830’s. The first mention of the mines was in 1250, during World War II when the caves became an air raid shelter for 15000 people with electrical lighting, a chapel and a hospital. The caves are now a tourist attraction and have been used for TV series Merlin (2008) and Vinnie Jones film The Riddle (2007). The production also visited Stone House Farm Caves which represented the cave system entrance on Solos. It is situated near Strood in a field next to Lower Rochester Road. The caves are thought to be old chalk mines. The Medway area has previously been seen on screen in Jekyll and Hyde (2015), Great Expectations (2012) and Canterbury Tales (2003). 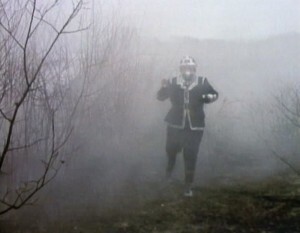 Doctor Who: The Mutants was first shown in 1972 and is now available to buy on DVD. 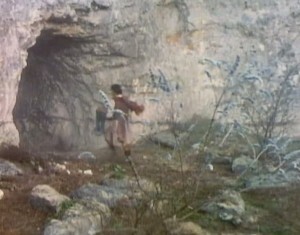 This entry was posted in Filmed in Kent and tagged Bluewater Quarry, Chislehurst Caves, Doctor Who - The Mutants film locations, Jon Pertwee, Stone House Farm Caves, TV Drama. Bookmark the permalink.